01.Strictly NO ENTRY in prohibited areas at ANY TIME for ANY REASON. designated gates when going out of boundaries. 03.No ski patrol outside the ski areas. Leave boundaries at your own risk. 04.Gates will close if conditions deemes dangerous. Out of boundary skiing is prohibited when gates are closed. 06.YOU WILL BE CHARGED for search and rescue efforts outside boundaries. 07.All users both in and out of boundaries must obey the ski patrol’s authority at all times. 08.Children under 12 must refrain from going out of bounds unless accompanied by a proficient adult leader. 09.Niseko Resorts and the local community respect the freedom of mountain users and place a strong emphasis on THE SAGE USAGE of the mountain. 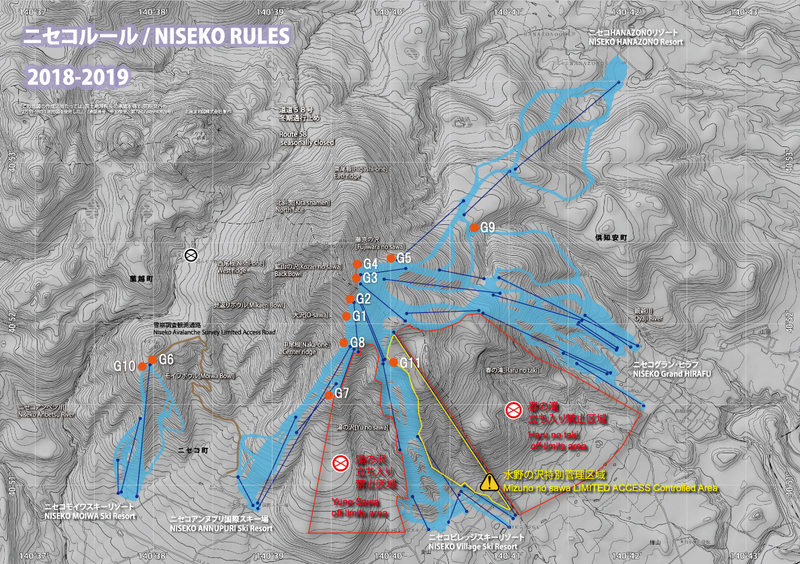 Any violators of the Niseko Rules will have their lift pass confiscated. All expenses brought about by search and rescue efforts outside the ski area will be requested. Many avalanches occur in furing blizzards in areas where snowy overhangs occur.